Getting rich is a long-term game. The good news is that starting to accumulate wealth is almost entirely under your control — all it takes is patience, the right mentality, and smart habits. Whether it be out of laziness or ignorance, many people continue to pay ATM fees — and the seemingly insignificant charges can add up over time. In fact, consumers these days are paying an average of $4.35 each time they use an out-of-network ATM. A good rule of thumb for 2016: If it's not your bank's logo, don't use it. If you live in a major city and use one of the traditional, bigger banks, there should be various ATM options nearby, which you can find ahead of time online. If your bank doesn't have convenient ATM options — or if you live in a smaller town with fewer ATMs — you may want to consider opening a checking account with a more accessible or online bank. Buying coffee ... and lunch ... and snacks every day. There's no getting around it — money is irresistibly easy to spend, especially on the small stuff. It's hard to walk far in any city or town and not pass an enticing coffee shop, juice bar, or fast-food joint. A small mental lapse could easily leave you $5 short every day, and giving into two cravings could mean $10 out the window within minutes. That's money that could be directed toward your savings goals or be growing substantially in a retirement account. There's nothing wrong with buying the occasional lunch or coffee to go, but if you're aiming to achieve major financial goals in 2016, this is one of the simplest ways to cut back without making dramatic sacrifices. Tapping into your retirement funds for extra money. Once you contribute money to a 401(k), IRA, or other retirement account, keep your hands off of it. Besides facing fees — most traditional IRA withdrawals made before age 59 1/2 incur taxes, as well as a 10% penalty — you're putting your financial future at risk by preventing your retirement savings from growing over time. Everyday purchases and unexpected expenses have a way of adding up, and trying to keep track of them in your head simply won't cut it. Particularly if you're prone to overspending or making impulse purchases, it's time to start actively recording and analyzing your spending habits. You'll most likely find something that either you didn't know you were spending your money on, or you felt was unnecessary. If you don't want to keep a spreadsheet on your computer or write your purchases in a notebook, consider an app that will automatically track your expenses for you like Mint, You Need a Budget, or LearnVest. Once you've pinpointed an unnecessary daily expense, don't stop there. Do something with that extra cash — contribute it to a retirement account or other savings account so it can accumulate and grow into thousands of dollars over time. Lose the invincibility complex and plan for the worst, as an unanticipated emergency could turn your life upside down instantaneously. Do you have renters insurance? Disability insurance? Homeowners insurance? Start by looking at the types of insurance you should buy at every age. Next, put in time to research insurance plans, or talk to a trusted adviser. Only paying the minimum on your credit-card balance. Most credit cards only require you to pay 1% to 3% of your balance each month, which can be an alluring prospect if your budget is tight. That's why the option is there — if you can't afford to pay your balance, you can at least keep a record of consistent and timely payments to the credit-card company. Taking that route will cost you a fortune in the long run. Interest rates vary depending on the card, but credit cards charge an average of 15% on unpaid balances. Make a habit out of paying more than you need to each month — or, preferably, making payments in full right off the bat. It will save you thousands of unnecessary dollars spent on interest. All debt is not equal. While you'll always want to pay the minimum on your various debts, an effective strategy is "racking and stacking": Simply rank your debt in order of highest to lowest interest rates and then prioritize paying off the debt with the highest interest rate first. Once it's paid off, move down your list and tackle the next debt with the highest interest rate. Treating unexpected or irregular expenses as one-time costs. Unexpected expenses — the wedding gift you forgot to buy, the unlucky parking ticket, or the emergency flight home you had to book — have a way of surfacing when you least expect them and can easily send you over budget. While it can be tempting to brush these expenses off as too infrequent to account for, it only takes one overdraft fee on your checking account to realize why it's so important to be prepared. Start preparing for both known, irregular expenses (vehicle-registration fees, Christmas gifts, or vacations) and unknown, surprise expenses (wedding or baby-shower gifts, late fees, and unpredictable medical expenses) by working them into your savings plan. There's more to late bill payments than late fees — repeatedly missing payments can also lower your credit score, which will affect your ability to borrow money in the future when bigger purchases — a home or car — come along. Never miss a bill again by setting up automatic payments online for fixed costs such as cable, internet, Netflix, and insurance. For payments that can't be made online or that vary, such as rent and credit-card bills, set up calendar reminders and get in the habit of paying them around the same time each month so that it becomes an ingrained routine. Settling for a sub-par rate. Paying your bills on time is a good habit — but paying more than you should is a bad one. Negotiating just $10 off your monthly bills means an extra $120 a year, and you may be surprised at how easy it is to get a lower cable, internet, or cellphone price by simply picking up the phone — at the end of the day, companies are often willing to make allowances to keep their customers. If you want to take it a step further, cancel your cable all together and look into more economical replacements. Buying cheap to "save" in the moment. It's tempting to try to "save money" by buying inexpensive, low-quality things, but oftentimes those cheap products will cost you in the long run. Dedicate 2016 to shopping for value, which may mean cutting back on your trips to the dollar store or the cheapest place on the block. Paychecks and bonuses — especially your first ones — are incredibly liberating. What's more, retirement seems too far off to start considering, making it even easier to overspend in the moment and put your future savings on hold. Stick to the age-old advice of paying yourself first: Set aside at least 10% for your future as you would any other cost, make sure your present is secure, and then spend whatever is left over. Operating without a savings goal. That 10% (or more) you're setting aside feels a lot more pressing if you're saving for "a three-bedroom center-hall Colonial" instead of "the future." 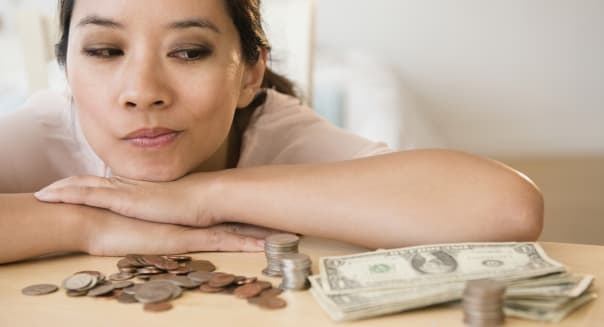 Setting savings goals for major expenses that you hope will be in your future, like a home, car, graduate school, or vacation, is an important part of staying motivated to save. Determine what big purchases are in your future, and calculate how much you need to save for them and for how long. You don't have to set aside a massive chunk of money each week. Start small — a little bit of savings each day or week can go a long way over time. For instance, taking a $1,000 vacation to Palm Springs a year from today means you need to set aside a little under $3 a day until then. Tweak your budget to accommodate that $90-ish a month by spending a little less, and you'll be well on your way to the desert.